In September, 22-year-old Scott Zeilinski sued the owner and staff of Nick's Short Stop Party Store in Clinton Township, Michigan, alleging that he was shot and wounded during a visit to the store. Those allegations appear to be true. The likely problem for the plaintiff here is that he was robbing the store at the time. Zeilinski was convicted of armed robbery for the incident, which took place in November 2007. According to court records, Zeilinski came into the store wearing a mask and brandishing a knife, which he reportedly held to the employees' throats while threatening to kill them. After he got some cash and cigarettes (hey, smokes are expensive these days), he started to make his way out of the store, still making threats. One of the clerks grabbed a gun and shot Zeilinski twice. Zeilinski, who is serving an 8-to-22-year sentence, has now sued and is demanding upwards of $125,000 for the pain, suffering, and emotional distress inflicted on him by the people he had just robbed. He will probably argue that the force used was disproportionate since he "only" had a knife and was, apparently, shot in the back. Those facts make it a little reminiscent of a case I wrote about in 2006, in which a man sued AutoZone and two of its employees for injuries he incurred while robbing them. There, the robber had the gun, but the employees managed to take it away from him and then merrily beat him with a pipe as he was running away. 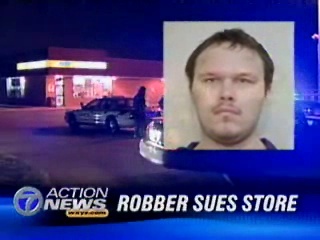 He argued they should have stopped hitting him once the robbery ended. I have never robbed anyone or been robbed, but I would guess that it's not always that clear when a robbery has actually ended, so I would not have a problem with them erring on the side of some additional beating. I mean, you never know when the guy might get up and start robbing you again. Michigan, like many other states, has what are sometimes called "stand your ground" laws intended to aid the defendant in cases like these. But whether or not Zeilinski's claim is legally barred, its jury appeal is, shall we say, limited.